This is a wonderful opportunity to discover this small artisan Cognac house dating back to 1912. All the Cognacs created by this family run house is grown exclusively in the Borderies terroir of the region. This really does make them experts in creating these unique Cognacs - and it shows! 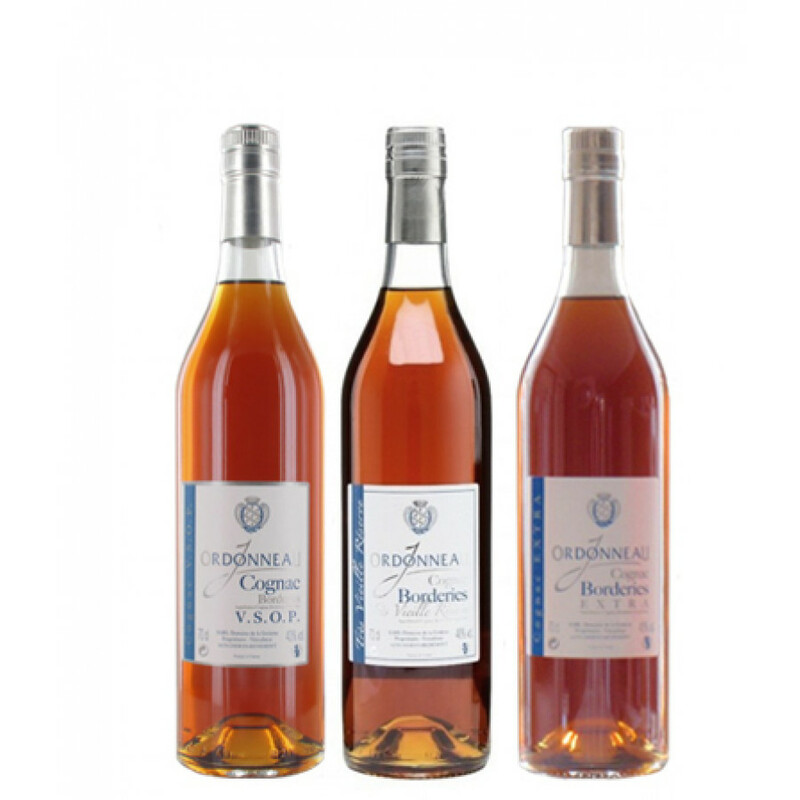 The Orrdonneau 3 Bottle Cognac set is made up of three different qualities (ages) of Cognac. The VSOP, the Extra (also known as a Napoleon), and the Tres Vieille Reserve. It's a superb set, and having such a variety from the same producer AND the same growth area makes for an excellent chance to truly compare and contrast the differences between them. And of course, purchasing such a set means an excellent saving on the price of each individual bottle. Each bottle is a full size, and is presented in a simplistic, traditional style bottle. 1 x bottle of Ordonneau VSOP Cognac: Made solely from eaux-de-vie from the smallest terroir of the region - Borderies. One of the great things about this Cognac is that many of the components used in the blend have been aged far in excess of the official BNIC rules for a VSOP. In fact, many have been aged for as long as three decades! This has led to a truly rounded blend rarely tasted in a Cognac of VSOP quality. 1 x bottle of Ordonneau Extra Cognac: An Extra/Napoleon quality Cognac made, as are all of Ordonneau's Cognacs, solely from the Borderies terroir. All of the eaux-de-vies used in the blend have been aged for around 25 years so, as you can imagine, this is a Cognac of substance and character. A delightful choice for the perfect after dinner digestif. 1 x bottle of Ordonneau Tres Vielle Reserve Cognac: This is the oldest produced by the Cognac house - and it's a real treat for the senses. From the deep color on the eye, so typical of a well-aged Cognac, to the delicious aromas, the ever-changing palate, and of course, the truly satisfying long finish, this is a Cognac to savor. Definitely one to bring out on special occasions. This is such a great trilogy.. you may think: wait, these cognacs look so standard.. yes! Exactly, that's what I thought too. But if you look at the value for money, and the great comparison you can do between those 3 different full bottle size cognacs.. such a great set. And it includes even an EXTRA and a Vielle Reserve!